The BPSWA is much more than some older guys taking care of a collection of old buses. 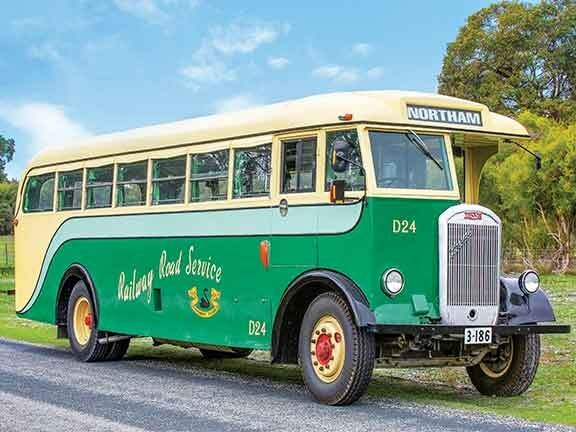 They have received national recognition for the work they do in the preservation and presentation of the social and engineering heritage of the historic buses used in Western Australia, and the importance of this collection is acknowledged as one of national historic significance for Australia. 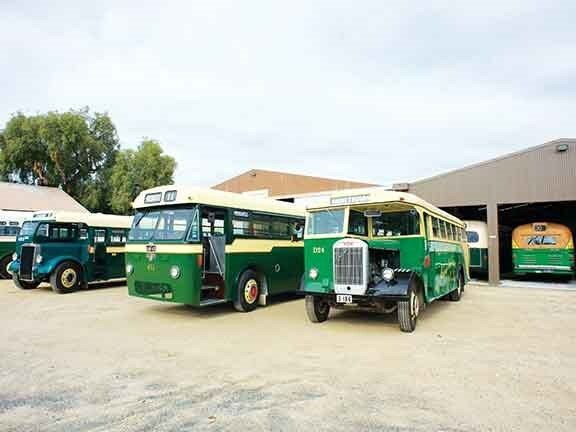 "Our aim is to preserve Western Australian bus history for current and future generations and everything we do is geared towards achieving that," says Colin Davison, one of the many knowledgeable volunteers I met with. For me, a usual test drive is the opportunity to learn about the latest technology and developments in the bus industry and experience the luxuries of some very impressive vehicles. But this heritage fleet was impressive for very different reasons. Built in 1947, the Dennis Lancet J3 was one of three half-cab buses imported from Britain by the Western Australian Government Railway for their road services when a lot of country trains were no longer viable and buses were used to service outlying smaller communities instead. This bus is significant because it is the only original surviving half-cab bus. This Lancet J3 was initially was based in the Northam area and in the 1950s was sent to Banksiadale where the government railways had a timber mill to cut sleepers and other timber for the railway. The bus transported mill workers between their homes and the mill. After a fire caused the closure of the sawmill in 1961, the Lancet J3 was sold by the WAGR and used as a school bus between Fairbridge Farm and Pinjarra. Its next life saw it converted and the interior stripped to become a mobile home. It was then acquired by BPSWA member Terry Duke in Albany in 1982. This was a lucky acquisition as the owner was about to remove the mechanical components and place the body on a bush block. The bus was driven to Perth and partially cosmetically restored. It passed through a succession of various BPSWA members before being donated to the society in 2003. Over the next seven years it was fully cosmetically and mechanically restored to its former glory. Now sporting the Larch Green, Eau de Nil and Cream colours, it has a replacement Dennis engine made up of the parts of four salvaged and rare Dennis 06 engines. It is a rare bus both because it does have an original Dennis engine and because of its significant role in Western Australia’s transport history. When I arrived I had the pick of what bus to test drive, but the Lancet J3 certainly stood out with its great green paint job and large grill. 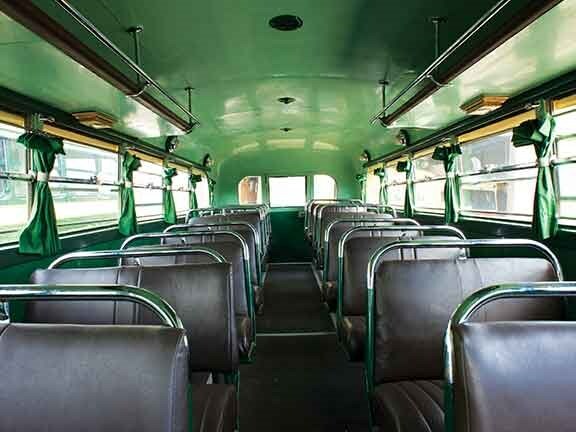 The old bus certainly is impressive – the restoration has been done so well it feels all original. Being inside the old bus certainly transports you to another time. My parents could have taken a bus like this to school. It seats 34 passengers, has overhead luggage racks, winding windows with curtains, and a side, driver and rear door with external chrome pram racks on the rear. The rare Dennis 6-cylinder diesel 7.6-litre engine is vertically mounted alongside the driver and I expected the noise from the engine to be louder than it was. Although we didn’t leave the flat roads of Whiteman Park and I only got the bus into fourth gear once, you could feel the bus would easily handle highway driving. The gear changes where smooth at the beginning until the gear box and engine heated up. I was advised the clutch was ready for an overhaul. 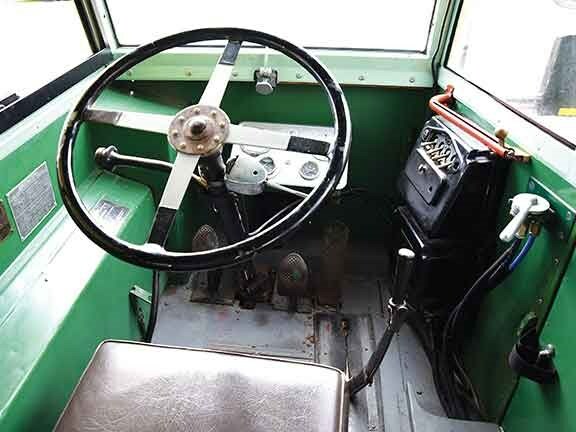 The old bus has Armstrong steering and it would definitely take us modern-day bus drivers a bit of getting used to and a strong arm. I guess, though, in 1947 there weren’t as many cars on the road and life moved at a more civil pace. The society has been likened to a men’s shed, as most of the volunteers are retired men that come here to the BPSWA for lots of reasons. Some love the old buses, some come for the companionship and friendship, and some just enjoy the work and the important historical work they do. The volunteers have a common goal – they all want to see important transport history preserved for future generations. They have just successfully signed a 10-year lease with increased land area, which is a great addition to help them achieve their goals. I thoroughly recommend all bus enthusiasts, if you are travelling to Western Australia, to take the time to go visit the BPSWA and see the great work these volunteers are doing to preserve our transport history. The BPSWA commenced in 1969 when the first Perth trolley bus system was closing down and a group of enthusiasts decided to form a club to preserve the history. "One thing led to another and in the early days they aimed their work solely at the preservation of trams and trolley buses, but in 1972 an offer came through to preserve a diesel bus, Number 81," Colin says. "This was our first bus. Later circumstances led to the splitting of the two sections into two separate organisations, and this is how the Bus Preservation Society began. "The society is run by a committee. We have a president, a vice president, a treasurer and secretary as the main office holders, and we have a committee that sets which bus will be restored next and to what level. 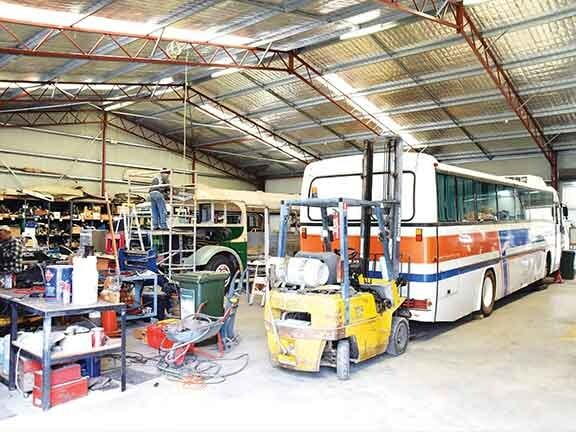 "We always attempt to restore the buses to an operating level but the rarity and availability of spare parts plays a large part in that process. If parts are unavailable, we restore vehicles solely for display purposes. The organisation is self-funded and at present has two main streams of income for financially support. "On weekends we use some of our buses to run services in Whiteman Park, which is a 4000-hectare parkland north of Perth. The park pays us to run the service and this has the added benefit of keeping the buses active," Colin says. "The other income comes from scrap recycling. For any buses that we have stripped for spare parts, we break up the remains and sell for scrap and recycling. "We collect dead batteries from businesses that support us and recycle those as well." I asked if they hire out the fleet for special occasions or events as I could see them featuring in television commercials or movies. However, he explained that this is very limited as they need to keep operating costs at a minimum, therefore the buses are registered under a concession 404 licence, so any outside usage is restricted. The BPSWA has more than 60 buses in the collection, but over a third of those are to be used for spare parts rather than restoration projects. Eighteen of the buses are operational and can be driven, and they do have some awaiting restoration that have come here directly once their bus service days have ended. "We generally purchase our buses for very reasonable prices – sometimes at scrap metal prices," Colin says. "Quite a few have been donated by private owners or bus enthusiasts that realise the scope of owning and restoring historic buses and then pass them onto us. "We have a broad expertise range available to us and the knowledge that makes restoring these vehicles much easier than it is for individual enthusiasts. We get spare parts by buying buses that are too far gone to restore but with serviceable units like engines and gearboxes. "Sometimes it’s not about keeping buses running but up to a showable standard." Volunteers come from all walks of life. "Surprisingly, we have a few school teachers that have great memories of school excursions so have an affinity with the buses. We have bankers and a broad range of different industries here, but by far the most come from the public transport sector – mostly ex-bus drivers and technical people. "The volunteers come from a range of different age groups but mostly are retired. "All of the historical knowledge needs to be passed onto younger generations to ensure we keep the history going. "This is challenging as the younger volunteers have busier lives and less free time to absorb the history, so passing on the knowledge is certainly a quandary." The society opens on a Tuesday and regularly has 20-25 volunteers. Not all are in the workshop. Some work on administration, archiving and storekeeping. While Colin doesn’t have a favourite in the fleet, "I am partial to the Leyland Panther 988 because in my driving days the Panther was always a very popular bus". Body: Steel-framed believed to have been imported from the United Kingdom in kit form. 34 seats.